the Briscoes vs PCO & Brody King have been booked for the road to G1 Supercard show in Baltimore. 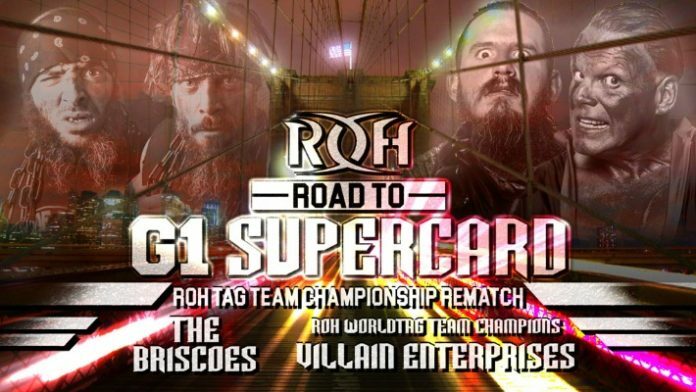 At the G1 Supercard from Madison Square Garden on April 6th, 4 teams will vie for both the ROH tag team and IWGP Heavyweight tag team titles. One week beforehand, however, PCO & Brody King will look to defend their ROH tag team titles against the former 10x champions, the Briscoes. ROH has just announced that the title rematch between the two teams has been added to the Road to G1 Supercard show on March 31st in Baltimore. Jay Briscoe recently cut a promo stating he and his brother have rematch clauses they want to cash in before MSG. PCO & Brody King defeated the Briscoes for the ROH Tag team titles earlier this month at ROH’s 17th Anniversary PPV.